Lucas Duda, the Mets' primary number three hitter, has four RBI in the last two weeks. Steven Matz had four RBI in his major league debut. Michael Cuddyer, the Mets' primary cleanup hitter, has one RBI in the last two weeks. Matz doubled that total in his first at bat. The Mets starting rotation of Matt Harvey, Jacob deGrom, Noah Syndergaard, Jon Niese, Bartolo Colon and Matz now has 12 RBI in 135 at bats. Ruben Tejada has 12 RBI in 138 at bats. Eric Campbell has 12 RBI in 128 at bats. Matz had a great debut on the mound (7 2/3 innings, 2 runs, 5 hits, 3 walks, 6 strikeouts), at the plate (3 for 3 with a double and the aforementioned 4 RBI) and on the basepaths (breaking up a double play at second). No other pitcher has driven in four runs in his debut in the last 100 years. But part of what makes Matz such an overnight sensation is the hitting wasteland the Mets have turned into this year. Sure, injuries have hurt (it's painful to note that Matz now has the same number of RBI this season as David Wright), but you can't expect regular hitting contributions from your pitcher unless you're a Little League team. Great pitching can get you some low-scoring wins (before the Matz game, the Mets had won three straight by scores of 2-0, 2-1 and 2-1) but the winning run in that last game scored in the 13th inning with the help of two errors. Matz' amazing debut can't hide the fact that the Mets are still in dire need of bats that can be in the lineup more than every five or six days. At least the Mets can't be beat when it comes to great senior-citizen fans. Just one day after Noah Syndergaard's 97-year-old great aunt made her own major league debut, attending her first game, Matz' grandfather stole the show. Ladies and gentlemen: the Tanaka face! Have you ever been in one of those tumultuous relationships in which your boyfriend or girlfriend is a hot mess? You know, where you have real passion for the other person, and you think you click with them when you go out together, but they constantly let you down? Yet just when you are ready to give up on the relationship, your boyfriend or girlfriend comes sniffing around again, doing something immensely appealing and keeping you hanging on some more, until they let you down again and the cycle continues? That's kind of what Masahiro Tanaka is like. Ever since he tore his elbow, he has simply awful starts, then shows flashes of brilliance. Unfortunately, he is in the "awful starts" part of his repertoire now. In his previous start, Tanaka had tanked in every way — allowing 10 hits, seven runs and three home runs over five innings in a 12-4 loss to the Tigers. The three home runs allowed, one to Victor Martinez and two to J.D. Martinez, marked a career high. Tanaka also tied a career high in runs (7) and earned runs (5) and he has never allowed more hits in a start. Yesterday, Tanaka was staked to a 6-0 lead, and promptly gave it back over six innings. He gave up six runs, seven hits, and only had three strikeouts. He tied the 3-homer record that he established in his last start, and gave up more earned runs (6) than he ever has before. 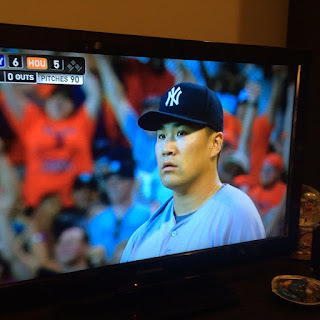 And when he melted down in the sixth, most notably when Jose Altuve hit a homer off him to tie the game, we got to see the Tanaka Face for the first time! Of course, the thousand-pound rhinoceros (or, in Alex Rodriguez’s preferred parlance, the pink elephant) in the room is, and will for the foreseeable future be, whatever hidden rat traps lurk within Tanaka’s elbow. But what if it is not his elbow? What if it is just that Tanaka really stinks, and it is not his elbow causing this? But if it is his elbow, when is he going to get Tommy John surgery? The Yankees did come back and win the game yesterday, 9-6. But if they are going to make the postseason, they need Tanaka to be a good boyfriend an ace again! I missed watching the first half of the game live, although I did later on see the clip (see below) of Astros starter Brett Oberholtzer throwing inside to Alex Rodriguez after Houston hometown hero Chris Young's homer, the pitcher promptly getting ejected for doing so, and then Oberholtzer appearing to blame his glove for the bad pitching, hurling the glove in the dugout. The Houston starter was sent to the minors after the game. The Yankee broadcasters called Oberholtzer "bush league," said the pitch was not the mark of a true competitor and said he should "take it like a man." Remember how Boston Red Sox pitcher Ryan Dempster threw four times in a row at A-Rod and the umps let him get away with it? Those times are over. Thought it was telling about Rodriguez' current reputation in the game that one inside pitch to him is enough to get the pitcher ejected. It's clear that CC Sabathia is A-Rod's BFF. 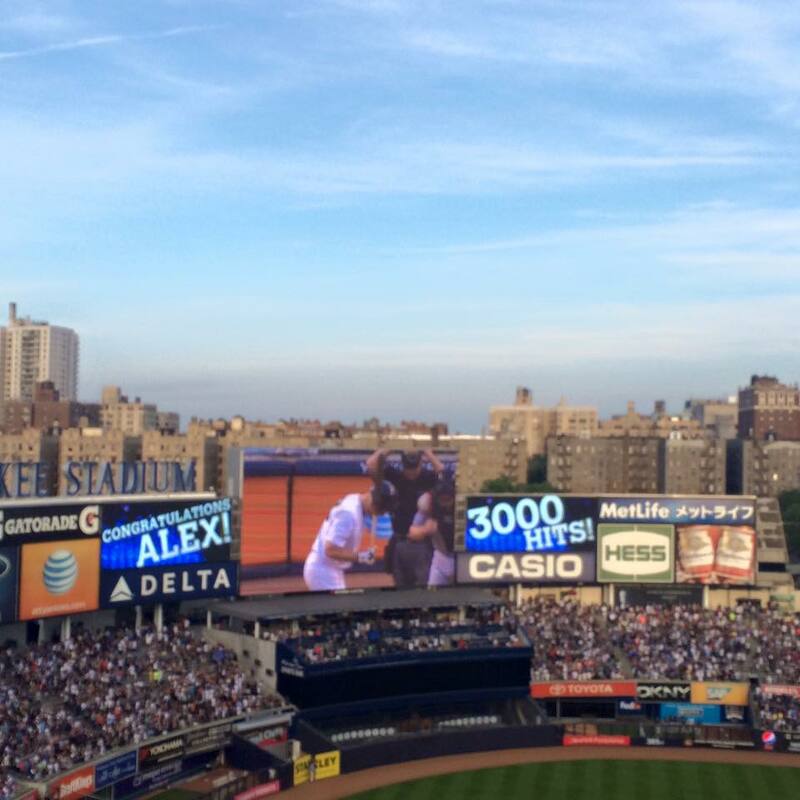 When A-Rod hit #3000, one of the players he hugged was CC. Then Sabathia spent big coin on "Ace of Spades" champagne for a postgame toast. Now the pitcher was the first out of the dugout, ready to rumble after Alex got hit. Big change from the early days of A-Rod on the team! I wish I had CC in my posse! Heck, I wish I had a posse! Meanwhile, until a few years ago, my childhood friend Carolyn was not allowed to marry Beth, the love of her life, because they are of the same gender. And it wasn't that long ago that LGBT people were arrested for exercising their sexual preference. So today's Supreme Court decision bringing marriage equality to all 50 states is really something to celebrate. I am not going to claim I fully understand what Carolyn or any of my other gay or lesbian friends have gone through in life. Because I can't. But because I am only attracted to men, I still had the freedom to love whom I loved without society deeming me a sinner or bad person or throwing me in jail or the psych ward. Or having to lie to my family and friends about my feelings. So I am happy that my gay and lesbian friends can now marry whomever they love, no matter what state they are in. But I must warn them of one thing: that means that they may have nagging mothers telling them to get married, too, even when they haven't found the right person yet! Yesterday, I had the pleasure of attending NBCUniversal's New York Summer Press Day at the Four Seasons Hotel in Manhattan. I have covered several NBC-related events this year, including the "Celebrity Apprentice" finale and the "America's Got Talent" pajama party premiere. But the thing I attended yesterday was a much larger event -- 28 TV shows, with the talent available for roundtable interviews for each show. The way these interviews worked is that a certain number of journalists/bloggers (usually four or five) are at each round table, and the actors/reality show stars go from table to table to talk about their show. These interviews usually take 10-15 minutes, which sounds like a short period of time, but a lot of topics can be covered in that time frame. I thought I was going to be nervous, because this was my first time at as big an event as this. But I really wasn't, and I actually enjoyed asking questions in the interviews! It was great to talk to Daniel Sunjata and Aaron Tveit of USA's "Graceland" about what difference it makes in portraying a TV role when the actor knows all of the arcs of the season beforehand, such as in HBO's "True Detective," or when the same director works on multiple episodes. Both men are smart and thoughtful. I remembered hearing about how MLB players and other athletes are huge fans of USA's "Suits," so I asked the cast about that. They got very animated in explaining why this is, and talked about corresponding with some of these famous fans. If the interview with "The Carmichael Show" stars Jerrod Carmichael and David Alan Grier is any indication, the NBC show is going to be the funniest thing on the air this year. Carmichael had a riff involving "The Golden Girls" and our table that had me laughing so hard I couldn't breathe. Another show I think is going to be a huge hit: NBC's "The Player," which stars Philip Winchester. The actor explained the high-concept plot to us, which involves rich people gambling on the crime rate in Las Vegas. He even pulled up a trailer of the show on one of the reporter's iPad to show us scenes from the program. Extremely charming man. The show, which is from the producers of "The Blacklist," will be airing right after that program on Thursdays. Hearing Zachary Levi expound on two projects he is involved in: the 13-episode "Heroes Reborn" series (which Levi made sound interesting, even to a non-sci-fi person like me!) and the "Geeks Who Drink" game show, which evolved from the popular pub game (Squawker Jon and I have played and won at this game in Manhattan!) Very bright, savvy actor. If you think pro wrestlers are dumb, think again. Chris Jericho of USA's "WWE's Tough Enough" and the Bella twins of E! 's "Total Divas" were intelligent and thoughtful. I asked Jericho about the changes in wrestling over the years, and he explained it in great detail. Brie and Nikki Bella were very smart about branding themselves, and building a future in a tough business. I ended up watching an episode of "Odd Mom Out" when I got home after meeting Jill Kargman and Abby Elliott. It is a pretty funny show, with a plotline about spinning that I could totally relate to. Anyhow, I will expound more on the interviews of the day in separate articles. I have a lot of audio recordings to go through! Is Zack Hample, the guy who caught A-Rod's 3000th hit, a righteous dude or a jerk? Zack Hample hold's A-Rod's 3000th hit ball. So, I have been on record advocating over and over that if a fan catches a historic ball at a game, whether it be Derek Jeter's 3000th hit or Alex Rodriguez's 660th homer or 3000th hit, that he or she should make as much money as possible out of it. Sorry, but if it were me catching such a historic ball, I would want some cold hard cash in return. Getting some trinkets wouldn't cut it. The only exception is what happened to Frank Burke, the person who caught San Francisco Giant Travis Ishikawa's pennant-winning home run. Burke, as I noted in an article for Guideposts.org, got to throw out the first pitch at Game 3 of the World Series that year. That is something unique you would not be able to buy on your own with the money you would get from selling the ball. That being said, Zack Hample is really testing my patience. He is the professional ballhawk (or, as I call him, ballhog) who caught A-Rod's 3000th hit, which was a homer. Today, when he was whining online about A-Rod not following him on Twitter, I pointed out what he said earlier in the week, when somebody asked what he would do if he caught #Arod3k. Hey, @AROD, I'm the guy who snagged your 3,000th hit. Any chance for a follow back? It would mean a lot to me. I have heard too many stories from various people about how Hample knocks down children to snag balls before games to disbelieve them. Not to mention the way he conducts himself. Squawker Jon pointed out Friday that the spotlight would not be kind to Mister Hample, and he was right. And I really have an issue with a 37-year-old man trolling for balls like this. Leave the glove at home, dude. At any rate, how ironic is it that the team that won't pay A-Rod for the 660-homer milestone is negotiating on his behalf for another milestone! Jon said that Hal Steinbrenner authorized the front office's pursuit of the ball. Hilarious! In his negotiations, Hample brought up a "wish list," including donations to charity, to try to make it seem as if he isn't a jerk. Won't work, dude! You pretty much emanate jerkitude. You wear an umpire's cap to games, for goodness sake! But own it! I say go for that cold hard cash, and forget pretending that this is about charity or any such other high-minded pretense. They need to show you the money. However, that also means giving the Yankees a simple price, and not doing these drama queen negotiations. If Hample doesn't want to negotiate with the Yankees, then sell the ball at an auction house and be done with it. But please, put an end to this drawn-out saga already. Good grief. Amazing how much a genuine smile can take years off one's age! My article takes up 3/4 of the page! Talk about a motivation to do well! I cheered, and then got teary-eyed, when I saw my name in the subhead, and my words in print. I wept later when I thanked my best friend Jon for sending that to me at just the right time. It was amazing to see this article in the paper! They gave me 1475 words to crack jokes about Madonna and defend A-Rod. Wait, what? How did this happen? I would like to imagine President Obama or Speaker Boehner reading the WaPo this morning to see what's what in Washington, and having their jaws drop after reading my article. Dare to dream! Yes, I am a tease. Literally! Anyhow, back to my race today. You may remember me recently talking about a fellow running club member named Ryan, who lost 90 pounds in his own fitness journey. (I referenced him in this Squawk here.) I want to be Ryan one day -- he is a real inspiration! So, the race I did today was an out-and-back one, with the last part of it up a driveway. Ryan, who had finished his own race, decided to join me as my running buddy for the rest of my own race. What a nice thing to do! I don't think it is an accident that, despite the miserable weather (I do not like heat or humidity, and we had both! ), between Squawker Jon's and Ryan's kind gestures, I had my second-best time ever in a 5K. Very cool! However, all is not all sunshine and lollipops. I have gotten a lot of angry comments over my Washington Post article on A-Rod. I knew this was coming! Bring. It. On. Two of the things I have been accused of are 1) being a Yankee fan and 2) a blogger. Yes, guilty as charged on both counts! Yet you read it! Have a great day! I was going to point out that while I am still overweight, I do NOT have a fat can. I am the opposite of the Jennifer Lopezes of the world when it comes to the tuchis! P.S. Speaking of my overuse in this blog of the word "tuchis," I made a Derek Jeter tuchis-kissing joke in my article, but it was edited out. Oh well. 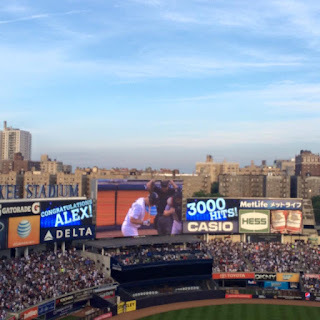 I had a few other thoughts about Friday night's game, in which I got to see Alex Rodriguez hit #3000. Here is a link to Alex's post-game presser. He really seems as relaxed as I can ever remember him. But he is wearing a simple light blue button-down shirt. Doesn't he know that when you hit 3000, you are supposed to wear a hat and shirt with a logo featuring an image of yourself and your achievement? That is what a team-first guy like Derek Jeter did after getting his 3000th hit! 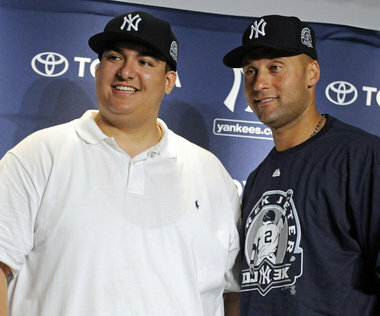 Jeter, of course, had Christian (Sap) Lopez willing to give up the HR ball for a few trinkets. On the other hand, A-Rod is being shaken down by D-lister and professional ball hog Zack Hample, who said earlier this week that he would give Alex a dummy ball back if he happened to catch #3000. What class, what integrity! Look, I think that if you catch such a momentous ball, you ought to be fairly compensated for it, with real money. That being said, Hample sounds like a real jerk. It was charming when he was a teenager going around catching balls. But he is 37 now, and I find it a little sad. 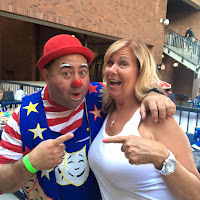 (Then again, I am 48 and got so excited when I met Mr. Met that I gave him a hug!) IMHO, you need to leave the glove at home when attending games once you graduate high school. Hample brags about having snagged 8,000 balls. Reportedly, he has also knocked down little kids to do so. He denies it, but there are way too many witnesses who saw him do such things to believe him. That stuff is pretty pricey -- I think it's at least $6,500 for one bottle, if not more! 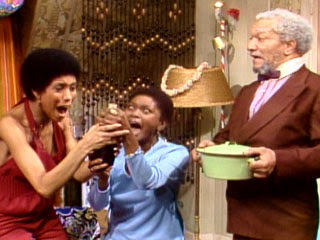 I will be lucky if somebody opens up a bottle of Ripple (Fred Sanford's favorite drink!) to toast my being in the Washington Post! I noticed that the music played Friday when the Yankees came on the field was "Pour Some Sugar on Me," by Def Leppard. But where is the stripper pole? That is what I associate that song with! That and getting ready to go out to college parties. "Pour Some Sugar on Me" was the primping and preening song we used to play. At any rate, I don't associate it with baseball! So to hear it played after AROD3K was just too much! Amazing! Last night, when the Yankees actually acknowledged an Alex Rodriguez milestone (and didn't even edit it out in the YES rebroadcast! ), I couldn't help but think of the sad fate of most recent Mets milestones. Jose Reyes winning the only batting title in Mets history is remembered for how he left the final game in the first inning. Johan Santana pitching the long-awaited first Mets' no-hitter can't be mentioned without noting how it basically ended Santana's career. Met fans don't have much to celebrate, so it's time for us to reclaim our milestones. Sure, Reyes was no Ted Williams, who famously played a doubleheader on the final day of the 1941 season when he could have sat out and seen his .3996 batting average rounded up to .400. But remembering Reyes as a villain also makes the failure to re-sign him more palatable. Why should the Mets pay top dollar for an oft-injured, me-first player? Here's why - with a real shortstop and leadoff hitter, the Mets would have a much stronger shot at the postseason. Think the Mets couldn't use the leadoff hitter for the team that's leading MLB in runs by a wide margin? Yes, Reyes has missed a lot of time this season as is often the case with him, but Toronto is 25-14 in games he's started and 12-18 when he has not played. Last night, Wilmer Flores made yet another mistake at shortstop, taking so long to look the runner back at third that he failed to get the runner at first. Flores' bat may belong somewhere in the lineup, but does anyone besides Sandy Alderson see him as the longterm shortstop on a winning team built on pitching? After Flores' miscue, Terry Collins pulled Jacob deGrom, though he was pitching a shutout and had thrown just 97 pitches. Sean Gilmartin allowed both runners to score on a double that gave the Braves a 2-1 win and deGrom an undeserved loss. "You can't say it was the right decision or the wrong decision," he added. "Because you don't know. No doctor ever told me, 'Oh, if you didn't throw so many pitches in this game or that game, your shoulder would not have been hurt again.'" If Santana can enjoy his no-hitter without regrets, I want to be able to as well. Sometimes the Mets go too far when celebrating a milestone. Squawker Lisa and I were at Citi Field when Mariano Rivera got his 500th save in 2009, but I was too irritated by Francisco Rodriguez walking Mariano with the bases loaded to even mention the achievement in my blog entry. At the end of the season, the Mets sent Mariano the pitching rubber from that game along with a congratulatory letter from Omar Minaya and Jeff Wilpon. As long as the Mets engage in shameless Yankee honoring, I hope they honor A-Rod's milestones, especially the ones the Yankees skip over, when the Yankees come to Citi Field in September. It's interesting how A-Rod's homer milestones stopped being valuable when the Yankees decided that was the case. Steiner Sports is selling a framed autographed photo of A-Rod hitting number 600 for $554.99. By comparison, if you want a framed photo of Bucky Dent's famed 1978 homer signed by both Dent and pitcher Mike Torrez, that will cost $169.99. For once, I took a semi-decent photo! Today was a great day for me for a variety of reasons. My Washington Post piece on A-Rod was published (and I got really touching notes from friends, relatives, and bosses praising it! ), and best-selling business writer Jon Acuff tweeted out to his 257k+ followers something I wrote! And it was capped by me being present for #AROD3K! Yay! 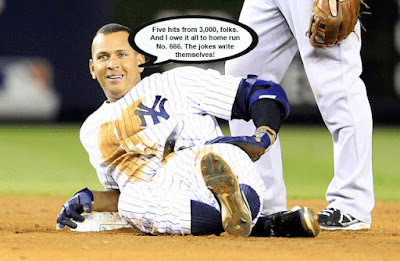 I wrote earlier today that I thought Alex Rodriguez was going to get his 3000th hit tonight. I said: "Alex will have to reach 3000 since I will be in the house, won't he? "And whaddaya know? He did it! I just watched the YES Network replay. What I wasn't able to see from the cheap seat I was in is how happy Rodriguez looks. He was actually giggling when he got up to the plate. I don't remember him ever being that relaxed and that confident. As somebody who wears her heart on her sleeve -- you can literally know what kind of mood I am by looking at me, no matter how much I may attempt to hide it --I appreciate that. And when you are in the kind of mood Alex was in tonight, nobody is going to stop you! I also noticed how much his teammates respect and genuinely like him. MICHAEL: My father’s no different from any other powerful man. Any man who’s responsible for other people. Like a senator or president. KAY: You know how naïve you sound? Senators and presidents don’t have men killed. MICHAEL: Oh. Who’s being naïve, Kay? I think I'm going to start saying that when it comes to PEDs -- who's being naive! So, does this make me Michael Corleone? I do say I love the way he rocks that hat! Anyhow, my article for the Washington Post talks about role models. The way Rodriguez has crawled back out of the hole he dug for himself is really inspiring. I don't get why people want perfection our of role models. For example, somebody in my running club told me about a fellow member who had lost 90 pounds and was now making great times. I don't think it is a coincidence that when I finally met this person and talked to him, I had my best time ever! His story -- and his advice -- resonated with me in a way for my own fitness journey that hearing about a runner who never had a weight problem might not have. 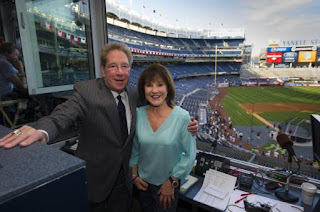 But I was listening to the Yankees radio broadcast, so I heard John Sterling call it, and I heard the crowd boo and chant a certain epithet when Sam Dyson refused to throw anything that A-Rod could hit. Pretty funny. I was glad he didn't get to hit, though. After all, I have tickets for tonight's game. And Alex will have to reach 3000 since I will be in the house, won't he? Anyhow, I am totally fascinated by the way A-Rod has bounced back this year. It wasn't that long ago when a certain segment of fans (and sportswriters!) said that the team should just cut him. Remember that? Now he is arguably the Yankees' MVP, and definitely the team's most popular player! Anyhow, as Squawker Jon pointed out earlier today, I wrote an article for the Washington Post called "The Redemption of A-Rod." I initially hoped to be on the paper's online PostEverything area. Somehow, not only did I end up in the Outlook (op-ed) section, which is where their big-name columnists write, but my article will be in the Sunday Washington Post, which has the most circulation of any of their editions. I feel blessed and honored and all that good stuff. Unbelievable. So people in DC who are reading the Sunday WaPost to see the important things that are going on in the world will also see 1300 words or so of me squawking about A-Rod and cracking jokes. How funny is that? My degree in Arodology is finally coming in handy! In my continued efforts at not just my fitness journey, but at personal growth, I have been putting myself out there, trying to conquer my fears and hopefully becoming a thinner, braver and more confident person out of this. Part of that is trying things I have never done before. So the other night, I jumped on a trampoline for 45 minutes last night and survived! Heck, I thrived! I had so much fun it should be illegal. Now, it wasn't the type of trampoline Joba Chamberlain broke his ankle on -- and I gave him so much grief for! Instead, I took the Urban Rebounding class at the New York Health and Racquet Club, my gym (you can see a video of of the class works here.) You get a small, round personal "rebounder" trampoline that is only about a foot or so off the ground. And you bounce around on it. So much fun! I have wanted to do this class for a long time. But I wasn't about to do it when I was at my heaviest -- I was afraid of disaster! However, I have lost 40 pounds, so I figured it was time to give the class a try. It was fabulous. I am not done facing my fears. I still have plenty of things that terrify me. But I am a work in progress, and I am doing better than I was. Kind of like A-Rod! Lisa's A-Rod piece published in the Washington Post! Congratulations to Squawker Lisa, whose "The Redemption of A-Rod" is now live on the Washington Post's website, and in the opinions section no less! The piece is scheduled to run in the print edition Sunday. Read Lisa's piece here. After I finished up Tuesday night track with my running club, I noticed this text from Squawker Jon: "Eovaldi gave up 8 runs in 2/3 inning." To which I thought, "Brian Cashman sure is a supergenius, isn't he?" Tuesday night's game against the Miami Marlins was a matchup of two pitchers Cashman traded for each other -- Nathan Eovaldi and David Phelps. And in a shocking (well, not really) turn of events, Eovaldi stunk up the joint, while former Yankee Phelps pitched very well, giving up just two runs and six hits over seven innings, and the Marlins beat the Yankees, 12-2. In December, Cashman traded Phelps, Martin Prado, and $6 million in cash to the Marlins for Eovaldi, Garrett Jones, and Domingo German. The trade never made any sense. The Yanks ended up paying $10M for a two-month rental of Prado. They also would have been better keeping Phelps, as opposed to getting Eovaldi. And if they had kept Prado, he could have played second this year, which would have meant that the Stephen Drew Experience would be over. But that would make too much sense. Oh, and how about Giancarlo Stanton? He hit a homer off the Yanks to make the score 11-0, and he will be in the Bronx for the first time ever this Wednesday and Thursday,which should create some buzz. But he still can't eat a KitKat in the correct way! Spartan Race contest: We have a winner! Thanks to the good folks at Spartan Race headquarters, I was able to get a free pass to give away to one of our readers. Congratulations to Alex Albertini of Silver Spring, Maryland, who was picked at random to win the contest! He is a Facebook friend of mine. Alex has run the Boston Marathon but has never done a Spartan Race, so he is looking forward to using his access code! Thanks to everybody who entered, and to the Spartan folks. Their event changed my life, and I appreciate everything they have done for me -- and this blog. A-Rod hits #666 and gets 2000th RBI! Now, when will he hit #3000 (and get his $6M)? So Alex Rodriguez hit a slew of milestones Saturday. In a subject of great interest to me, A-Rod got home run #666 (yet the world is still turning! ), his 2000th RBI, and his 2995th hit. The Yankees even mentioned his feats on their Twitter account! Now Alex is just five away from his 3000th hit. I had originally thought last week that he would hit it this Wednesday, but I didn't factor in that the Yankees would be playing in Miami, a National League city, on Monday and Tuesday, and that A-Rod would not start both days. Given that, I think it is more likely that he will reach the milestone Friday night, or maybe even Saturday, which is Old Timers' Day! At any rate, since the Yankees start an eight-game homestand on Wednesday, the important thing is that Alex is extremely likely, short of the slump from hell, to hit #3000 at home. How perfectly delicious! How much are the Yankees going to hate to have to commemorate that, even if there is no milestone money involved!? While the Yankees remain confident in their position that A-Rod’s admission to using steroids and his subsequent year-long suspension from baseball has made him and his accomplishments unmarketable, they suggested to the MLB Players Association months ago that the dispute possibly could be settled by the Yankees making a donation — less than the $6 million — to a charity of Rodriguez’s choice. It is believed the only reason the Yankees made any suggestion to settle with a charity donation was because of the enormous cost of litigating the case — which would entail bringing in the U.S. Attorney’s office for the testimony A-Rod gave them in the Biogenesis case, along with the many witnesses in that case. Regardless, if it’s war he wants with them again, the Yankees are said to be confident they will win it and prepared to spend whatever it takes to make their case. This is just ridiculous. When are Madden (and the Yankees) going to admit that Alex is the team's most popular player now? And how would revealing confidential testimony make the argument that A-Rod is not marketable? That is a strange argument, and is really more Yankee bluster, meant to make the team look like they have a case here, when they don't. Madden brings up that ticket sales and ratings are down. But how much further would they be down if it weren't for Alex? It seems to me that A-Rod's team could do things like tracking t-shirt sales, All-Star votes, players' popularity on social media and message boards, and media ink to show that he is indeed popular -- and marketable. They could even have t-shirt creator Bald Vinny as a witness to talk about how many pro-Alex shirts he sells! "I'm not going into that now," he said. "All that stuff is family business and will be handled privately." "If you guys are interested in my charities, I'll be at the Boys & Girls Club on Tuesday," he said. "That's a great organization and we welcome all you guys to come out." I of course hope A-Rod wins his milestone case. Get your popcorn ready! Reveling in Boston Red Sox's fans abject misery -- yeah, I went there! is now known as Kung Boo Panda? Schadenfreude: It's not just for breakfast anymore! Have you seen what is going on in Red Sox Nation these days? Boston is having a positively Bobby Valentinesque year. The team is simply awful. They are in last place with a 27-37 record, one of the worst records in baseball. Pitcher Wade Miley threw a hissy fit and openly argued with manager John Farrell the other night, a move that elicited this classic Dennis Eckersley response, which included asking whether Miley were on acid. Dustin Pedroia lost a ball in the sun in hilarious fashion. Hanley Ramirez in left field makes Manny Ramirez look like Yaz. Now the Sox have lost six in a row, and the season looks pretty much over for them. And you know what? I am loving every minute of this. Are you kidding me? There hasn't been such comic gold in Beantown baseball since the days of the fried chicken and beer brigade! So I spent some time tonight looking for most pained, angry, agonized Red Sox fans on the internet, especially those on various Boston blogs. Does that make me a bad person? Well, then! Guess that means I have permission to share some of the best -- as in, most enjoyable for a Yankee fan to read! -- of Red Sox Nation's agony over the team as of late. I actually correspond with some of the Boston fans I am quoting here (Red and Denton of Surviving Grady are longtime friends of the Squawkers, and Monstah Mash is an up and coming blog that has some really fun writing!) But that doesn't mean I can't revel in their team's misfortune! But then–and it’s tough to replay it because I still can’t wrap my arms around everything that went wrong–the Red Sox let it get away with a loss so glorious, so insanely inconceivable, that it immediately ranked among the greatest Red Sox f*ck-ups of all time. Maybe top five. Ahead 8-4 going into the seventh, Matt Barnes, Junichi Tazawa and Tommy Layne gave up a staggering 8 hits and 9 runs in one inning, effectively torpedoing any positive mojo and goodwill left in the stands, possibly for the rest of the season. I'd go through the motions of typing it all out, but if you really want to subject yourself to this train wreck of an inning, well, I'll defer to the tape, because I just can't! Bad teams lose games. Bad teams lose games after taking the lead. Bad teams lose games that most other teams would win. But it feels like when the Red Sox go bad, they go the extra mile. And tonight, they really outdid themselves. Even if you're somehow of the opinion that 27-35 and seven games down in the AL East isn't enough to consider them out of the running, after seeing a performance like this, it's had to imagine even the most optimistic of Red Sox fans holding on hope. Commenter 54th MA: "That's the ballgame, that's the series, that's the season," and "For those of you who weren't around at the time, this is what the Boston Massacre of 1978 felt like. Or 1770 for that matter." Commenter Nuf Sed: "I am only watching this game because I don't own a ball peen hammer that I can use to pound myself in the head." Commenter Kilgore A. Trout: "I just don't understand this How is the manager not responsible when an entire team plays fundamentally bad baseball? Plays way below their norm? Not just one player, not two players, the entire team. For the second straight year. If that is not the manager's responsibility, then he literally has no responsibility and he's just a figurehead." BREAKING NEWS: The Boston Red Sox came out last night and lost their game against the Toronto Blue Jays in an implosion so spectacularly awful that it would make the death of the King Dome look mundane. 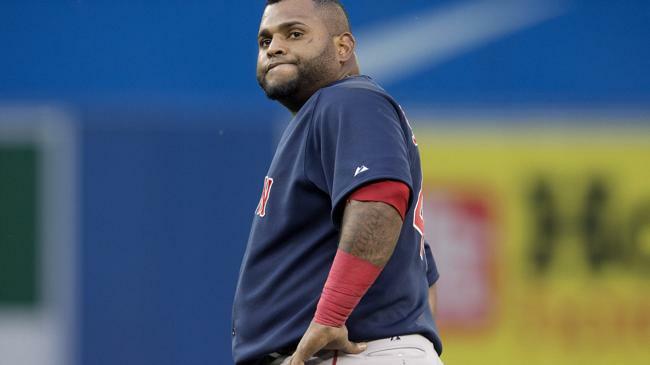 In related news, the sky is blue, hell is hot, and Pablo Sandoval is fat. Up 8-1 going into the seventh inning , the Red Sox voided their bowels all over the place, gave up nine runs in the inning, and lost the game 13-10. And honestly, I’m not mad about it, I’m just disappointed. I’m disappointed that at this point in the season, the Red Sox have beaten me down so much that I don’t even have the energy to fly off the handle like I did last week. I feel defeated. I haven’t hated a Red Sox team this much since the year 199never. And that includes the Bobby Valentine season. Yeah, you heard me, this is my least favorite Red Sox team ever. Seriously, f*ck this team, it’s a goddamn madhouse and the lunatics are running the asylum. What happened Thursday night was inexcusable: Miley as a player should know to respect his manager and he obviously doesn’t. He’s not alone either on the growing list of guys I’m sick of. There’s David Ortiz who takes every chance to turn the spotlight on himself and remind us how old his schtick is, or Hanley Ramirez who refuses to address his crappy performance in LF. And don’t get me started on the error-making machine Pablo Sandoval who makes me miss Will Middlebrooks. Point being: the Sox have about as much chemistry as the nerdy kid who gets saddled up with the cheerleader in a group project: none. Between this and Deflategate, it has been a fun spring for mocking Boston! Heh. But I still love all kinds of food, both good and bad for me. Which means that I face temptations all of the time. Like the constant amount of free food I am tempted with at work. For example, my office had a "cheese party" the other day, in which we had to taste various high-end cheeses for a work-related reason. Yes, really! Cheese is one of my favorite foods, and I actually have an educated palate on it, plus I want to help out at my job, so I ate some and gave my opinions and enjoyed the cheese. Then I walked from the office to the Staten Island Ferry on the way home to make up for the cheese I ate! As best friends. Squawker Jon and I have spent way too much time over the years going out to eat. My favorite restaurant is Red Rooster, but I have other faves throughout the city, from food trucks to fancy places. Which is why I have been making an effort to spend more time doing cultural and athletic activities instead of going out to eat all of the time! And as you can guess, one of my favorite types of food is barbecue. I lived in Texas for 15 years, after all! And Squawker Jon likes BBQ as well. So once we went to the yearly Big Apple BBQ Festival in Manhattan, we were big fans. However, as the event grew in popularity, it became a nightmare due to the long lines. I can't remember whether the last straw was the port-a-potty I went into at the festival that looked like something out of "Trainspotting," -- it was so bad, it caused an immediate reversal of fortune on my part. (Note: do not click on those links if you have a weak stomach!) Or whether or it was when we waited literally two hours in line for City Grocery's crawfish hushpuppies, only to have the stand close up shop due to the heat just before they were about to take our order! At any rate, we finally gave up on going for several years because it was just too crowded, even though I used to work right near it. It just seemed to be a huge hassle. Squawker Jon and I at the Big Apple BBQ Festival. I am wearing the medal I earned in the race. But earlier this year, we thought we would try the festival again, since the word on the street was that is was better run that in the past. However, I am supposed to be doing this fitness/weight loss journey to change my life. So in order to enjoy the barbecue with no guilt, I decided to sign up for the Oakley Mini 10K in Central Park for earlier in the morning. My thought was that I would make this a cheat day (or at least a cheat meal) and eat whatever I wanted, just for the festival. We decided to get to the Big Apple BBQ as soon as it opened at 11 to make sure that the lines were at a minimum. We ended up running late and got there at about 11:30 a.m., but even then, the lines were either small, or went very quickly. The plates at the event are small, so that people try multiple things. And we planned to eat a bunch of things. The first thing we each got was an order of baby back ribs and baked beans from 17th Street Barbecue, Mike Mills' place. Mills, who shares the same name as the bassist from R.E.M., is perhaps the most legendary name in BBQ. So I was very much looking forward to this meal. Then I started eating the ribs, and realized something a few bites in -- the food was awfully greasy. I also noticed all the sugar in the baked beans order. Was it me or the ribs? Jon loved them, and so did most everybody there. It was me. Have my taste buds or food preferences changed in a way where I don't like baby back ribs anymore? The horror! The horror! as Marlon Brando once said. I had a hard time finishing the ribs, and threw out the beans. Then I got brisket and sausage from the Salt Lick, one of my Texas favorites. The brisket was great, the way the brisket my brother and I had in Texas last month was fantastic. The sausage, not so much. It was greasy, too! I ended up throwing out half of it! Shocker! And while Jon went to a third place (Skylight Inn, from North Carolina, where the whole hog sandwich turned out to be his favorite dish of the day), I was more than satisfied with the food I ordered. Nobody was more surprised by this turn of events than me! Back in the day, we would have been there for hours. Now I was ready to go pretty quickly! The one real temptation I did have at the festival was the southern-style layer cake varieties from Sugaree's Bakery in Mississippi. Not only was the place named after "Sugaree," the Jerry Garcia/Grateful Dead song, but they had a strawberry layer cake! When I was a kid, I always requested either strawberry or cherry cake for my birthday, which my mother would make from a box. And here was a strawberry cake with strawberry buttercream frosting, made in a an authentic Southern way! I don't have a huge sweet tooth, like others do, but I do have particular things I like. And this was one of them! But I told myself that the new Lisa would channel the Allman Brothers and "eat a peach" (which I did -- a stand sold peaches and watermelon) instead of the cake. We were literally on our way out of the festival when that "Sugaree" cake called -- or is that sang? -- to me one more time. So I bought a strawberry slice and brought it home. And you know what? It was fantastic! Much better than what Mom used to make (sorry, Mom!) And I enjoyed every single bite of it. Now I need to go for a walk to burn off the calories; given how good it tasted, I am going to be walking to Long Island from Staten Island! 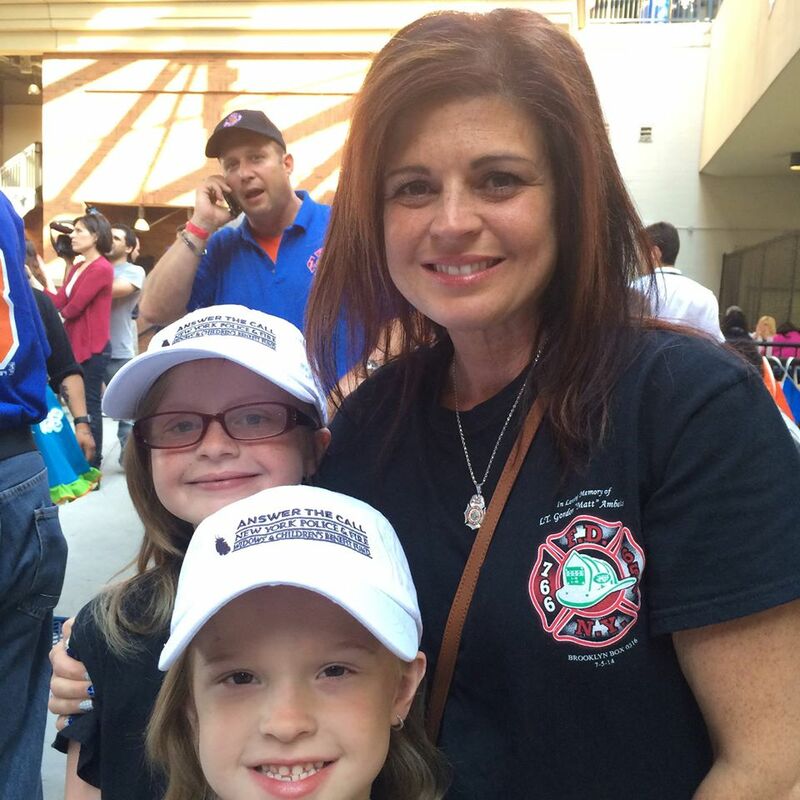 I had the privilege Wednesday of getting to attend the 31st Annual New York Police and Fire Widows’ and Children’s Benefit Fund Game and Family Day at Citi Field. 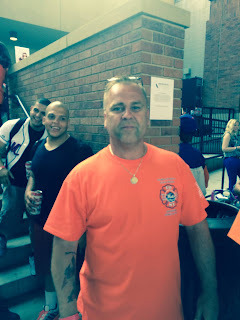 The Answer the Call event included a free pre-game picnic in the Bullpen Plaza area of the ballpark for about 800 relatives, family members, and supporters of fallen FDNY, NYPD, and PANY members. The charity was started in 1985 by Mets legend Rusty Staub. It was designed to make sure all of the families of those first responders killed in the line of duty would get taken care of for the rest of their lives. Arielle DiCiotto, Director of Development for the Benefit Fund, told me that the charity currently helps around 600 families of fallen first responders. She said that each family gets an immediate check of $25,000, and an annual stipend of $4,000. In all, the organization has given out an incredible $130 million to the families. 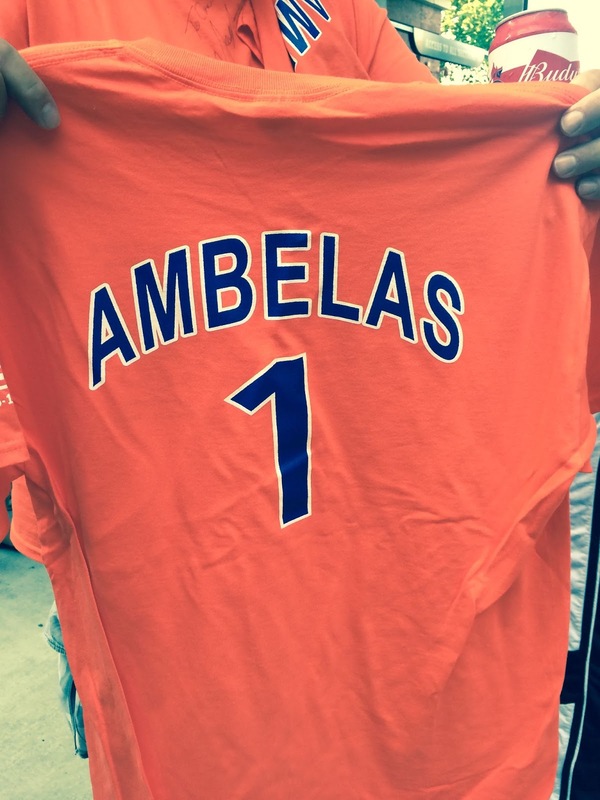 The front of the Ambelas tribute shirt. But the Benefit Fund is not just about helping the families with financial assistance. It is also about bringing them together. 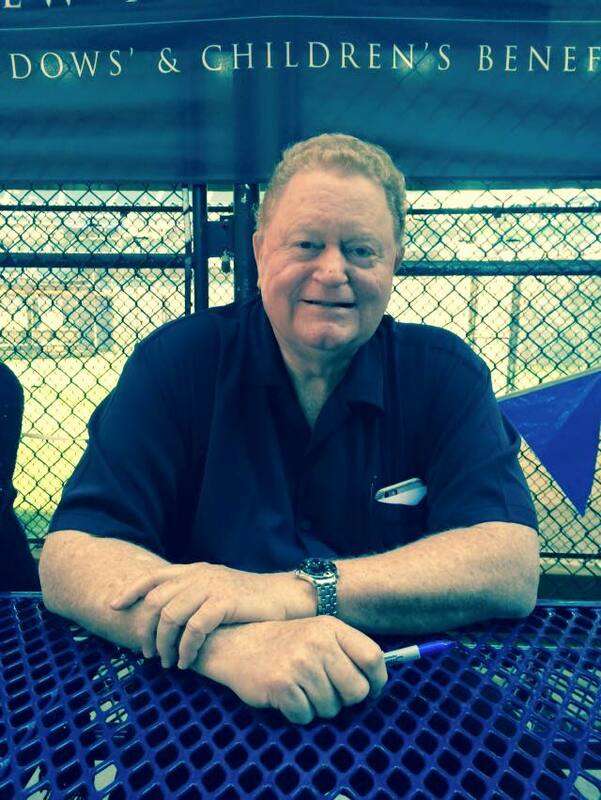 Rusty Staub pointed out that while we have empathy for the fallen first responder families, we cannot really understand what they are going through. But he said that the veteran family members -- those who lost their loved one years ago -- help those who recently lost a family member on the line of duty, and that this day helps bring them together. There are so many poignant stories here of how this terrific organization helps so many. So in order to break down how the Benefit Fund works, I am going to tell you what it means for one family. I didn't know Lt. Gordon (Matt) Ambelas, but he lived in my neighborhood on Staten Island, and his wake and funeral were literally around the block from me. I did go to one of the viewings for him when he passed away last July. The firefighter died in the line of duty while searching for victims in a Brooklyn apartment fire. who entertained the kids at the picnic. Also, my friend Margaret Gulliksen, who is an officer in the Staten Island Athletic Club, the running club I belong to, has a strong connection to the family. She and her husband George were best friends with the Ambelas family, and Margaret actually introduced Matt to his wife Nanette. Margaret read Nanette's eulogy at Lt. Ambelas' funeral. And our running club sponsored a race in his memory. Over 100 friends, family members, and fellow firefighters were there at the picnic in honor of Lt. Ambelas. 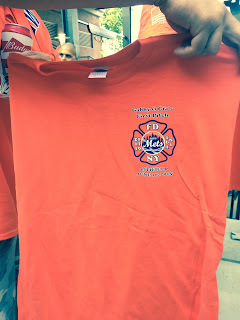 His Brooklyn firehouse made up t-shirts for their group (see above). I talked to Eric Bischoff about Lt. Ambelas. 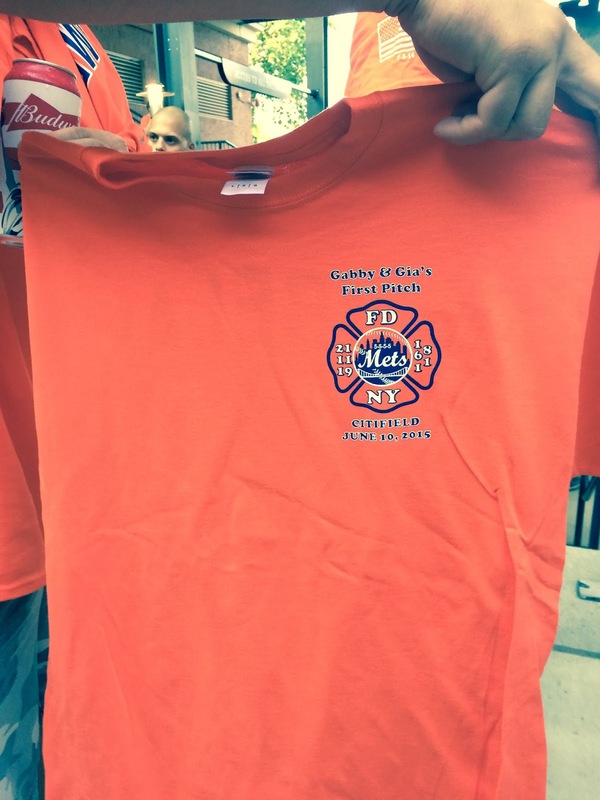 Bischoff is the Staten Island trustee for the Uniformed Firefighters Association, the firefighter's union, and he emceed the race. He also used to be Matt's roommate back in the day. The two were friends for over 13 years, and even vacationed together with their wives. Bischoff told me that after a firefighter dies, it takes a while for the money to come in from life insurance policies and other benefits to help the family. But two days after the firefighter's passing, representatives for the Benefit Fund showed up with a $25,000 check for the family, so they had immediate financial assistance. Bischoff also said that the families heal through events like this, and that things like this picnic show that the fallen heroes are not forgotten. I also got to say hello to Nanette Ambelas and her adorable daughters Giovanna and Gabriella. The two girls were among the children of the fallen heroes who threw out the first pitch at Wednesday's game. I asked her if they had practiced their first pitches. She smiled and said no. My friend Margaret, who is still close with the Ambelas family, called the event "awesome," and said she appreciated what the New York Mets were doing here in hosting the day. She said that days like this help the families feel really good, and feel like they mean something to New Yorkers as a nice tribute, instead of people just saying that it was a shame that the heroes died. She said "We're all happy" for the day," but at the same time we're sad because we miss him a lot." George Gulliksen, Margaret's husband, had recollections about his close friendship with Matt, and his words were happy and poignant. He said that he and Matt bonded right away when they met in the fire department 17 years ago partly because they had both worked at the post office before, and partly because they had so much in common. Both of them loved heavy metal music, especially Metallica and Iron Maiden, and they both had long hair in the 80s. Both liked to fish, and would frequently meet up at Willowbrook Park with their kids as the years went on and fish together. George described Lt. Ambelas as being an "incredible" person, and called him a great leader. He said Matt was "always smiling" and always ready to lend a helping hand to others. 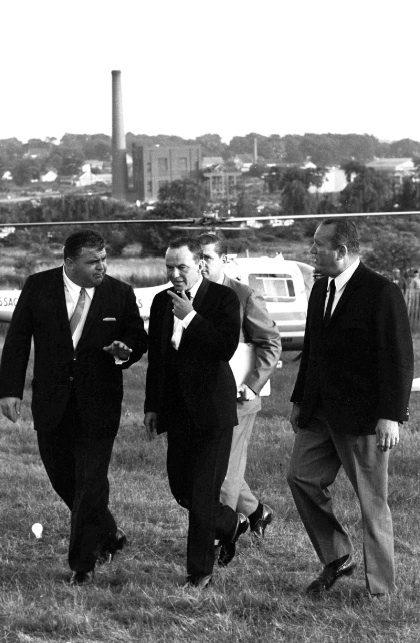 George described his best friend as being like the mayor of Staten Island, because he knew everyone. George and Matt were also both big fans of the New York Jets. Lt. Ambelas' favorite Jet player was Darrelle Revis. So when Revis came back to the Jets this year, George said he cried when he heard the news. Hearing all of these specific memories of Lt. Ambelas made me appreciate not just what a good man he was, but how his family and friends miss him so. It also illustrated why an organization like the New York Police and Fire Widows’ and Children’s Benefit Fund is so important -- because it ensures that the memory of fallen heroes will stay alive, and that they families will get meaningful assistance for the rest of their lives. Tonight I am going to the Morrison Hotel Gallery in SoHo for the opening of "Ken Regan - A Decade of Uncovered Images," sponsored by Long Island-based Bacari Vineyards. Ken Regan was an iconic photographer, known for a variety of iconic shots, including his rock-and-roll images and his shots of boxing's Rumble in the Jungle. He died of cancer in 2012. A native of the Bronx, New York, Regan logged countless hours on the road with rock stars, shooting the Beatles on their 1965 tour, Hendrix at the Fillmore East in 1968, Springsteen on the Amnesty International tour in 1988 and Neil Young at the Ryman Auditorium in 2005. He also photographed the Concert For Bangladesh in 1971, the Last Waltz in 1976 and Live Aid in 1985. In 1975, Regan toured with the Rolling Stones and Bob Dylan's Rolling Thunder Review, shooting thousands of pictures along the way. Regan was also known for taking pictures of other celebrities, including politicians like Ted Kennedy, legends like Oprah Winfrey, and actors like Julia Robers and Robert Redford. He wasn't just a music photographer or an acting photographer or a sports photographer or a political photographer. 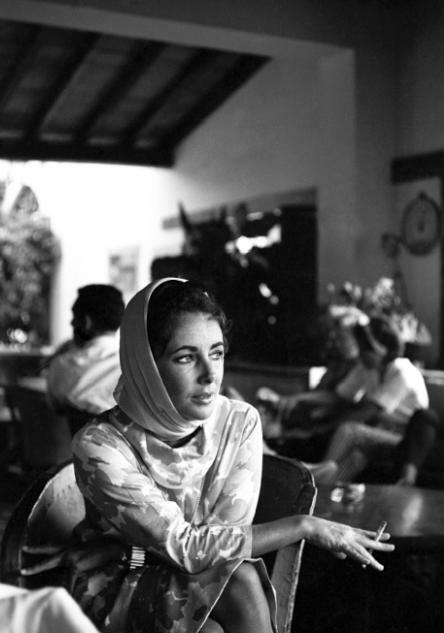 Ken Regan was a photographer. The Morrison Hotel exhibit will include 1960s-era rare photos of Woodstock, Frank Sinatra, the Kennedys, Elizabeth Taylor, the Black Panthers, the Mets, Barbara Hancock, and the Beatles. It also the first exhibit of his work since Regan passed away. After tonight's opening, the exhibit will run from Friday, June 12 thru Friday, July 3 at the Morrison Hotel Gallery, located at 116 Prince Street in SoHo. It is free to visit. I had kind of a busy day yesterday, so I am going to write about it in two very long Squawks. This one will be about the crazy fun and weird stuff of the day, including meeting and interviewing Buster Posey and watching Matt Harvey warm up for the game from about 10-15 feet away, something that got me called a jinx yet again! A later Squawk will be about the honor of attending the Mets' 31st Annual New York Police and Fire Widows’ and Children’s Benefit Fund Game and Family Day at Citi Field. Let's get started! My day started out in a very weird way, when I saw the following headline from the Staten Island Advance: "Great Kills dentist accused of exposing self to teen employee." It was my former dentist! Fortunately, I only went to Dr. Alan M. Kratenstein briefly last year. But, as somebody else pointed out to me, this dentist's hand was in my mouth, which made me feel sick for the rest of the morning. Oy. After a few hours at work, I headed to Topps headquarters to see superstar San Francisco Giants catcher Buster Posey in the flesh. (Thanks to my friend Joe Favorito for the invite!) Posey appeared at a presser there for bloggers to promote the fact that he is the baseball card company's new brand ambassador. And talk about perfect timing, given that he just caught a no-hitter the night before! You hear a lot about how Posey, who has three World Series rings in five years and an NL MVP award, and who has been voted the new Face of Baseball, is the new Derek Jeter. I actually think Posey is much more charming than Jeter, who too often seemed to talk in a monotone with dealing with the media, as if he were at a dentist visit! Posey has real star quality. 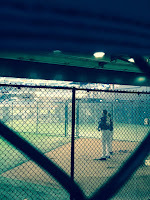 Even if you knew nothing about baseball, you would know that he was somebody, the way he carries himself. Very charismatic. Posey opens up the Topps baseball card box set. First card he sees? 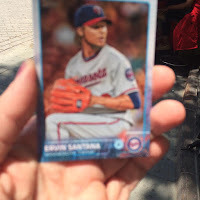 Ervin Santana. Heh. Anyhow, he talked about why he signed up to promote Topps. He said it was "really special" to represent the brand. Posey said that baseball cards are "something the younger generation can and should get excited about." He also noted that his grandfather is a big card collector. Someone asked Posey about what it was like to see himself on a baseball card for the first time. He called it a "cool moment" and "a little bit surreal," and said he would always remember that day. He also talked about how his three-year-old twins, a boy and a girl, act about seeing their father on a baseball card! Posey said that while a no-hitter is a "rare feat" is is "unique in its own way," there is also a "commonality in no-hitters" -- that the pitcher and catcher "are able to get on same page" and "keep that rhythm." Posey said the challenge was to be efficient. He also had a lot of praise for Chris Heston. Somebody asked him if he felt bad that he didn't catch one of Tim Lincecum's two no-hitters Posey had a very humble response, saying that there was no guarantee that Lincecum would have had a no-hitter that day with Posey as catcher! Posey touched. I took it home with me. My fellow Yankee fans will appreciate who Posey said "gets a ton of credit" for the team having so many no-hitters. That would be pitching coach Dave Righetti, who had a no-hitter of his own with the Yankees in 1983. He also credited Righetti as being "instrumental" in his progress as a catcher. A young reporter from SI for Kids then asked him a lot of questions. The best one was what superhero power Posey would want. He said to fly, as he doesn't like to sit in traffic! He also said his favorite move was Dumb and Dumber. Then Posey did a ceremonial opening of the new Topps Series 2 set for 2015. The very first card he saw? Ervin Santana of the Minnesota Twins, who is currently serving an 80-game suspension for PEDs. Everybody laughed over this. There should have also been sad trombone music! 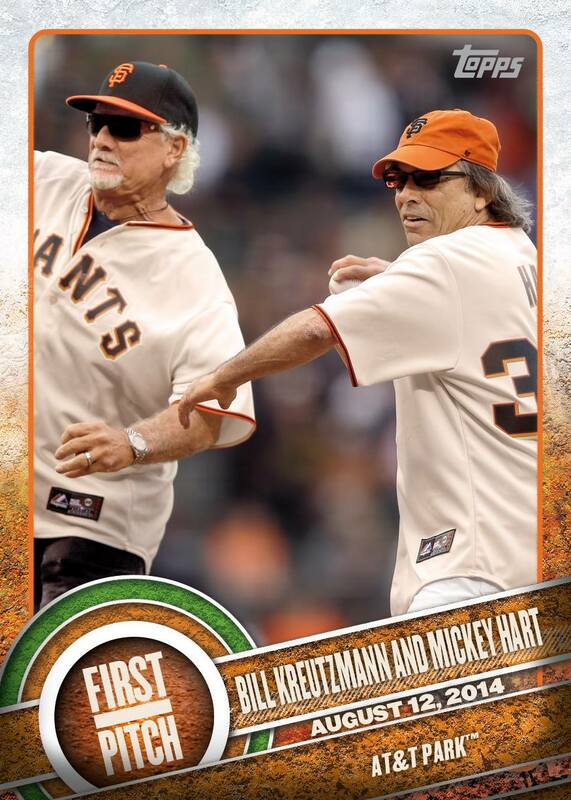 I got a picture of the Dead baseball card, but it only showed the front side of the card. So what was on the back of the card? Someone I work with wondered: "Does the back of the card list different drugs (think LSD instead of RBI) and quantities per season?" So I threw the question out to my Facebook friends, and received responses like: "Number of insufferable drum solos by tour," as well as "Road Trips (not W-L columns, in this case it's Good and Bad), visits to Dock Ellis' house, Toking Average, Bong Hits, Lyric Errors, etc." Other responses included "Number of times hallucinations involving fabulous furry freak brothers" and "Most joints rolled during one tour." Squawker Jon thought the Dead cards should be scratch and sniff. When I was at Topps headquarters, I also got to say hello to Topps staffer Chris Vaccaro, who I knew from our days at the Daily News. And I got to talk to Steve Keane, my fellow Staten Islander and blogger at the Eddie Kranepool Society. Also made a new friend -- a young woman named Brandon from FanDuel.com. My phone's camera went out of whack during part of the event, so she was nice enough to share some of her Buster Posey photos with me! Anyhow, I went back to work after this, and then headed to Citi Field in the late afternoon to go to the Answer the Call benefit game (details on that in a future Squawk.) I got to the media check-in at 5:15 p.m., as I was supposed to, but there was a snafu. Even though I had RSVPed, and gotten written confirmation on the RSVP, my name was not on the list. This could have been fixed in two minutes if the Mets' young receptionist hadn't been a (rhymes with witch). Even though I showed her this RSVP information, she simply would not listen to me or do anything about it. I wasn't surprised at how rude and unprofessional she was, given that her tank top and miniskirt getup was a very unprofessional workplace outfit, unless your workplace is on the pole! Because of her incompetence, I had to wait 45 minutes in the media check-in area until the Mets PR person I was dealing with contacted the Mets communications director -- the same person who got us access to Citi Field for our Guideposts Spartan Race photo shoot -- to get the situation fixed, and get me into the ballpark. 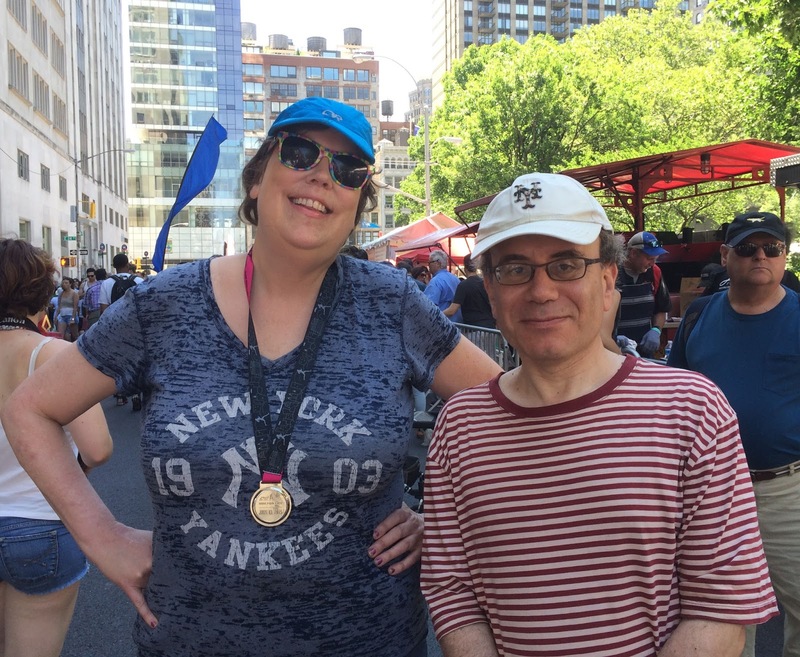 Fortunately, it all worked out in the end, and I was able to get some very moving quotes from people at the picnic, including getting to talk to Rusty Staub, the founder of the benefit fund. More on that later today. Something funny happened, though, while I was cooling my heels waiting. I saw an older gentleman with a baseball cap on his head come up to the receptionist and say that he was picking up tickets for himself, Tommy Lasorda, and Joe Torre. He then smiled at me while I was waiting -- he must have noticed how stressed I looked. His smile made me relax a little and feel better. I smiled back. Anyhow, I saw Lasorda come in after that, and I said hello. Was glad I didn't see Joe Torre, because I would have asked him things like "Why didn't you bunt on Curt Schilling?" and "Why did you pitch Jeff Weaver in the World Series?" and "Why did you hate A-Rod so much?" and it wouldn't have ended well! Anyhow, later on that night, I saw that same smiling, kindly man talking on the Mets broadcast with Torre during the game, talking about prostate cancer awareness. The man was billionaire Michael Milken. How funny is that? 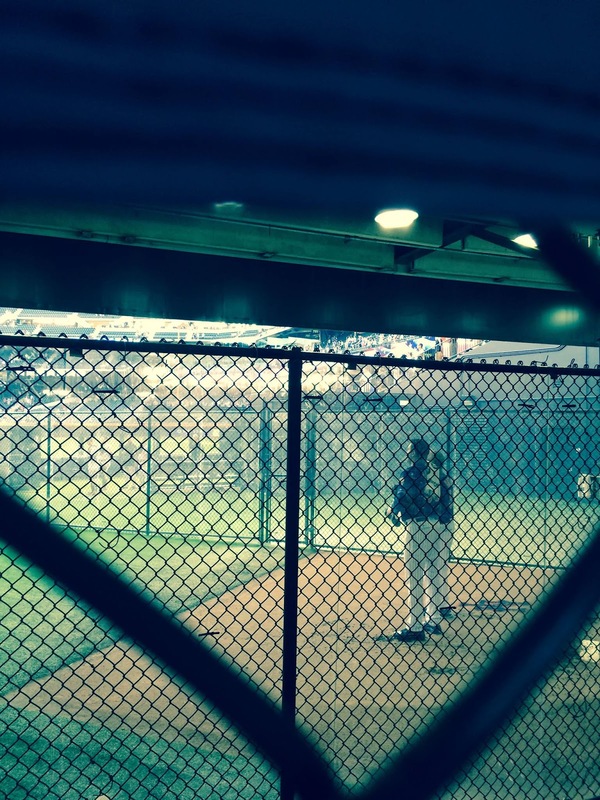 As for the game itself, I got to see Matt Harvey warm up and was about 10-15 feet behind him -- the picnic area was right behind the bullpen. He has a real swagger to him. Like Posey, Harvey has true star quality. But while Posey has an aw-shucks demeanor, Harvey is all strut. I joked on Facebook that I was scouting him for the Yankees, since we all know he will be in pinstripes at some point! Of course, seeing him in the flesh, and staying for the game, meant that I got the blame for being a jinx to Matt Harvey and the Mets. Squawker Jon pointed out that Harvey had never lost a game in which the Mets had scored four runs or more. That is, until now! 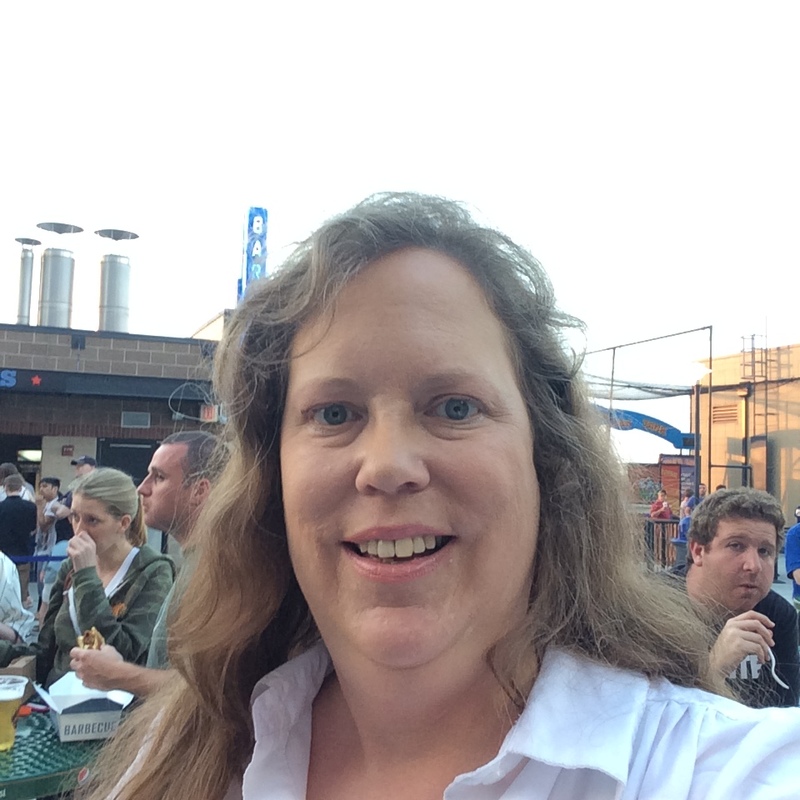 Me at the game, with a bad selfie. Jon said I look very startled! I only stayed until the middle of the sixth inning for the game, but the damage was done. Squawker Jon (and others!) blame me for Harvey's poor performance! During the game, I walked around the park, and also had a fabulous Patron margarita, as well as some carnitas tacos (without eating the shells.) Also got to meet Facebook friend Brad Kurtzberg at the game. Nice guy! As for Harvey, it does make me laugh how irate Jon was. He texted me: "What did u do to Harvey?" Hey, don't blame me! In all, it was a very busy day! Will write about the second half of the day later on this Thursday. Want to win a free Spartan Race entry? Read on!